A major event in the Orford calendar, is the annual Orford, Sudbourne & Gedgrave Flower Show and Fête, held usually, on the Saturday of the August Bank holiday. The Show marquee houses almost 200 exhibits of locally grown vegetables, fruit and flowers exhibited under exacting Flower Show Rules. Handicrafts, cooking, painting, photography and other talents are also included in the competitions with the extremes of the heaviest marrow, pumpkin etc. and the longest parsnip and runner bean, provide a major interest for both growers and novelty for visitors. Modest cash prizes as well as cups, trophies and certificates are keenly contested. Whilst produce, art and fine handicrafts form the focal point of the Show, the Fete provides a first–class afternoon out for all the family. Bouncy Castle, Punch and Judy, Coconut Shy and many other side-shows attract children and adults of all ages. Children’s races, some with parents are a popular draw, but perhaps the biggest attraction is the famous Orford Dog Race. Rules for this event are liberally interpreted with classes for small and large dogs. The ‘hounds’ are lined up by their owners, given a juicy bone to sniff which they chase over a short course. The spectacle of mixed breeds, some keen, some totally uninterested and some whose interest wanders in other directions, makes this exciting contest a fitting finale to the Fête. Although the paper records of the Orford and Gedgrave Horticultural Society (which organises the show) go back only to the 1930’s, the Orford Flower Show “like many others” probably has its origins in the 19th century. The Lords Hertford of Sudbourne Hall owned a vast agricultural and sporting estate of over 11,000 acres and several villages including Orford. In 1871, Sir Richard Wallace the illegitimate son of the fourth Marquis of Hertford purchased the Sudbourne Hall estate from his half-brother the fifth Marquis. In the 1880’s, Sir Richard procured a private Act of Parliament giving him the right to enclose common land in the village of Orford. In return, Sir Richard was obliged to give the village a recreation ground – which to his credit he did. This has provided the Flower Show with a permanent site ever since. The great 19th century land owners, such as the Hertfords and Sir Richard Wallace, promoted Flower and Produce shows to encourage improvement in horticultural practice and self-sufficiency among the rural poor. The shows were intentionally competitive. Local horticultural societies were formed to manage the Show following the lead of the Royal Horticultural Society that had been founded in 1804. There was also a connection with the allotment movement. 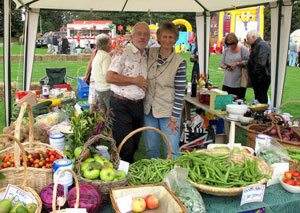 In the early days of the Show, there was an emphasis on the produce that was grown on the allotments around the village. The interest of the organisers extended to small – scale husbandry. Even up to the 1960’s, local people who qualified for the cottage classes could enter their eggs into the Show. The Show was probably abandoned in the First World War which is why the minutes of the organising committee start in the 1920‘s. The same happened in the Second World War. After the war ended a local resident Winifred Fison revived the Show and ran it until her death in 1982 ably assisted by local people including Peter Ashley and Spinney Bantoft. Over the last 25 years or so, the Show has diversified into such areas as painting, photography and the dog races. The fete has been expanded with colourful stalls, games and sideshows. The organisers have taken a deliberate decision to retain the spirit of a village show and keep out commercial interests whilst providing a “platform” for local charities and interest groups. The real history of the Show is in the lists of cup winners over the years.